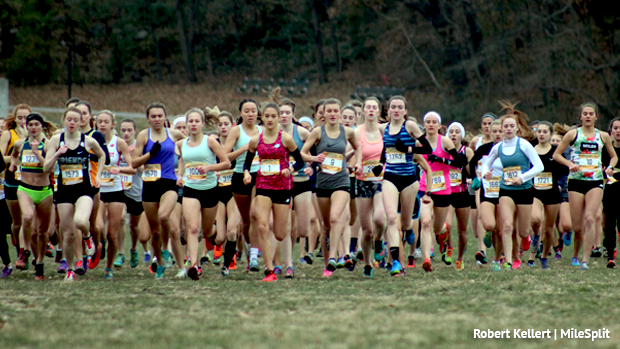 Three Pennsylvanians are headed to San Diego after taking top ten spots at the Foot Locker Northeast Regional at Van Cortlandt Park in the Bronx, New York. Marlee Starliper didn't defend her regional title, but the Northern junior ran the second fastest time ever by a PA girl at Van Cortlandt for Foot Locker Northeast. Starliper, the AA PA state champ dropped a 17:17 to take second to Connecticut's Sydney Masciarelli, who surprised the field by running a 17:12 to take the win. Lois Brommer of Mechanicsburg ran 17:04 at Van Cortlandt to win the Kinney Northeast Regional race in 1981. Starliper's time, on a chilly and cloudy day in NYC, tops Tessa Barrett's 2014 FLNE-winning time of 17:32 to put her at No. 2 on the all-time PA list. Barrett went on to win Foot Locker Nationals that year. Starliper and Masciarelli exited the woods stride-for-stride with about a half mile to go. In the end, Masciarelli kicked to the win in one of the meet's fastest times ever. The CT sophomore hasn't been competing against high schoolers much this fall, instead jumping in some races against professionals and collegians. Both girls will be among the favorites at Foot Locker Nationals in two weeks. Taryn Parks of Greencastle-Antrim went 18:11 to take seventh, also qualifying for nationals. It's Parks' third nationals qualification in as many tries. She'll have a shot to make it four-for-four next year as a senior. In the boys' race, Patrick Anderson of Mount Lebanon booked a trip to San Diego for Foot Locker Nationals. In his first career regionals race, the AAA state champion from three weeks ago hung in a big pack of contenders. Anderson came home in sixth place in a time of 15:38. He was the lone PA boy to make nationals. A few other PA runners made good runs at the top ten. Sharon's Gianna Labbiento was 12th in 18:33. Cedar Crest's Gwyneth Young (23rd in 19:03), Quaker Valley's Annie Wicker (25th in 19:05), and Germantown Academy's Isabelle Goldstein (27th in 19:09) turned in strong performances. The Fox Chapel duo of Grace Sisson and Sarena Seeger also placed inside the top 30 for All-Region honors. Mifflin County's Brayden Harris was the top sophomore boy in the field, placing 12th in the Championship race in 15:46. North East's Josh Lewis (13th in 15:59), Jenkintown's Jack Miller (21st in 16:14), and Dallas' Mitchell Rome (30th in 16:19) placed in the top 30 and earned All-Region.